Ben's Right Knee - Torn Meniscus or ACL? 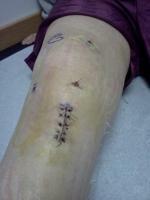 I injured my right knee playing basketball on 9/16/08. I planted my foot to jump and felt sharp pain on the knee and I could not put any weight on it for like 5 minutes. I was able to walk with a limp after that. The swelling has gone done now, but I cannot bend nor straighten my leg. There's a sharp pain on the back of the knee on the joint area when i try to bend or straighten the knee. Could this be a possible torn meniscus or an acl injury? Also, my PCP wants me to see a Rheumotologist becuase of fluid in the knee. I was actually pushing for an MRI. Do you think it is a waste of time seeing an Athritis doctor for my acute knee injury?